What is Youth & Community Development? The Rite of Passage Experience, also known as ROPE is the embodiment of the design principles found in the 20 elements in the architectural structure of youth & community development through rites of passage developed by the Center. It is one of the primary design strategies for community organizing, youth development and curriculum paths you can adapt to link your community’s education and youth development approaches. ROPE is a process that continually evolves to meet the changing challenges facing communities and raising children. A sequence of stages exist in which diverse members of a community engage in conversations – and participate in a learning journey to implement the strategy’s activities. 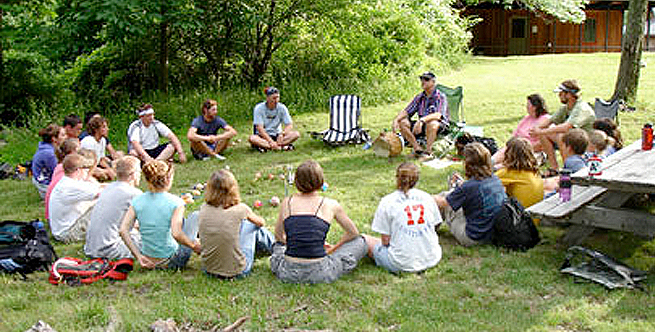 Conversation and “co-learning” lay a foundation for building a “core group” that can collaborate, recruit and coordinate the necessary resources for the successful “co-creation” of the ROPE process. Rites of passage occur over a period of time and recognize a child’s coming of age within a number of different environments, such as within their families, school, among peer, in their community and relationship to nature. ROPE recognizes this and works as a family, school and community-based initiative designed to guide children in grades 6-12 though adolescence and into adulthood while avoiding the pitfalls of alcohol, drugs and negative peer pressure. It offers parents/guardians and the community a language that unites them within shared expectations of responsibilities for raising their children together within a climate of respect. ROPE has been recognized as an exemplary approach to promoting youth development and leadership by a number of national and state organizations. Since its inception in 1981 ROPE or the principles of youth & community development through rites of passage have guided the designs of hundreds of rite of passage projects, adapted in small towns and large cities, by diverse cultures engaging hundreds of thousands of youth and their families across the United States, and around the world. It takes a whole village…. It takes a whole village to raise a child is a very popular phrase. But, what does it mean? How did the whole village raise a child? The answer lies in the anthropological records and archeological artifacts of human beings. Rites of passage were the way our species raised their children. They were the way essential knowledge and skills for the survival of their tribe and protection of their environment were transmitted to children. We still have this knowledge stored deep in our bones. We need guidance and support to re-member and to reconnect these important life-sustaining practices in our communities. It’s for the future of us all and the future of the planet. This educational video depicts a parent/student orientation. It is phase I of ROPE® and the “Call to Attention & Action” that commences and sets forth the context for a community-oriented rite of passage. It begins the initial separation of parents from their children entering their Rite Of Passage Experience ROPE. This is a three-part multi-year youth & community development strategy. It begins with parents and their children who are transitioning from primary to secondary school, typically when they are between 11-12 years old. Parents are introduced to the concepts of rites of passage and ROPE as the process to help their children come of age. Expectations are set forth and agreed upon for parents to come together and become the whole village that raises each other’s children. Children become initiates and are preparing to leave childhood behind. The community organizing process of rites of passage through the ROPE becomes the shared story that ties all other education and youth development approaches together. David Blumenkrantz licensed to the Center for Youth & Community, Inc.